"Vitamin C Foundation Approved® L-ascorbic acid is 300 grams pure European Quali-C® as a fine powder. The most economical sponsored vitamin C product. and support the Foundation. You may place orders and ask questions by phone: 800-894-9025 (USA). Note: The Vitamin C in all our products is DSM Quali-C manufactured in Europe to the highest standards. Why Choose the Ascorbic Acid form of Vitamin C? Vitamin C comes in various forms. Its most common form, however, is Ascorbic Acid (Hydrogen Ascorbate). Many people use the terms "vitamin C" and "ascorbic acid" interchangeably. The Vitamin C Foundation recommends only two forms of vitamin C orally: Ascorbic Acid (Hydrogen Ascorbate) and/or Sodium Ascorbate. Note: Only Sodium Ascorbate is recommended for intravenous infusion. Ascorbic acid is the most powerful and fastest acting form of vitamin C.
The world's leading clinical vitamin C expert, the late Robert Cathcart,III, M.D., believed that ascorbic acid was twice as powerful as any other form of vitamin C.
"I noticed that it was not entirely clear that the dramatic effects are always with ascorbic acid orally and sodium ascorbate intravenously. I have not been able to achieve the ascorbate effect with mineral ascorbates orally. Mineral ascorbates are fine forms of vitamin C but when you are really sick, the mineral ascorbates are not potent enough to accomplish the ascorbate effect. This is because the mitochondria are failing in their refueling of the free radical scavengers with electrons. The ascorbic acid carries 2 extra electrons per molecule where the mineral ascorbates seem to carry only one (plus per molecule the mineral ascorbates are heavier due to the mineral weighing more than the hydrogen the mineral replaces). There may be other reasons that we do not appreciate additionally." - Robert Cathcart, M.D. Oral ascorbic acid acts fast, at least in part because ascorbic acid can be absorbed through the stomach wall into the blood stream. The slower acting non-acidic mineral forms of vitamin C have to travel farther into the intestines before they can be absorbed. Vitamin C is defined as the substance that cures the deficiency disease scurvy. This separates the ascorbates from the ill-defined "natural vitamin C complex." Note that any "natural" complex, minus ascorbic acid, does not and cannot cure scurvy, and therefore, cannot be Vitamin C.
Not all Vitamin C is acidic. It is also found in various alkaline forms such as the mineral ascorbates: e.g. Sodium Ascorbate, Calcium Ascorbate, Magnesium Ascorbate, Potassium Ascorbate, etc. Sometimes the bottom of the esophagus becomes sore. This can make it hard to ingest large amounts of vitamin C as ascorbic acid. If you experience discomfort while swallowing ascorbic acid, then sodium ascorbate powder may be a better choice. Both forms of vitamin C, ascorbic acid and sodium ascorbate, have similar health benefits. Note: You may add some sodium bicarbonate (baking soda) to ascorbic acid in solution. The ensuing reaction turns some of the ascorbic acid into sodium ascorbate. Pure vitamin C powder is the form of the vitamin that we approve. No fillers. For those that find ascorbic acid powder hard to swallow, it is easy and inexpensive to make your own capsules. Check out your local health food store for generic capsules and the do-it-yourself capsule making kits. Setup Convenient Automatic Reorders and Receive the Best Price! ATTENTION: There are two prices for all approved products - regular retail and a lower priced option for recurring automatic reorder/shipment labeled "Automatic Shipping," or AUTOSHIP. 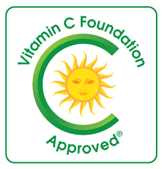 The NonProfit (VitaminCFoundation.ORG) Does Not Sell Vitamin C.
Inteligent*Vitamin*C Inc, DBA as VitaminCFoundation.COM sells Approved Vitamin C Products. "As they researched their book ASCORBATE, Hickey and Roberts began to wonder if Pauling's offense had been to discuss openly the properties of a substance that threatens the profitability of medicine. 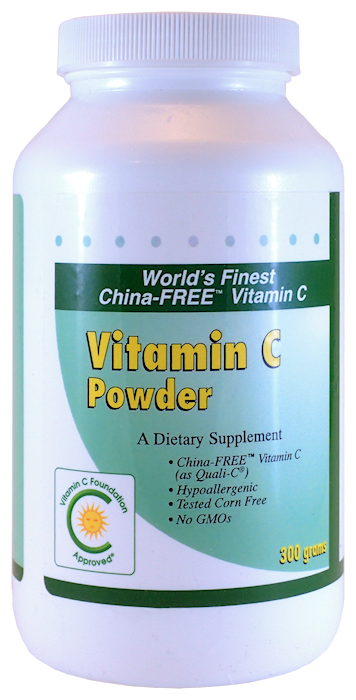 If the claims for vitamin C are correct, it might replace many lucrative and expensive medications." The world's best source of news and information about Vitamin C - ascorbic acid!